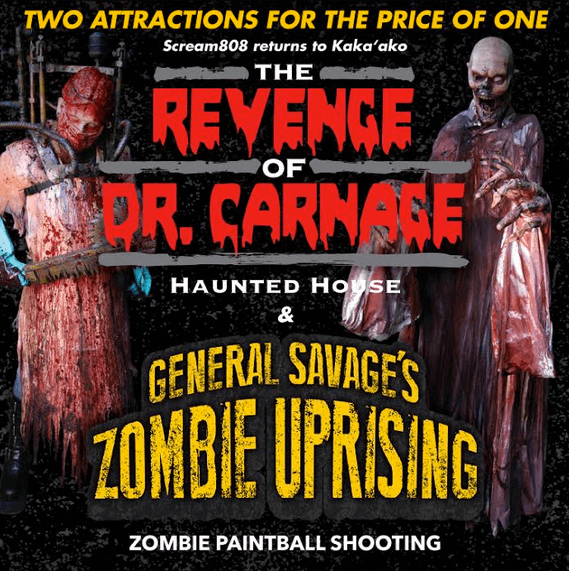 This Halloween, Scream808 returns to Kaka‘ako with two interactive Haunted Attractions “The Revenge of Dr. Carnage” and “The Zombie Uprising” shooting gallery. In 2014, Dr. Carnage’s House of Horrors took fright fans on a face to face journey with their worst fears and the gruesome reality of one man’s transformation from mild mannered doctor to an obsessed nightmare creator. Dr. Carnage has become completely insane crafting his own workshop of terrifying creations. Before you experience “The Revenge of Dr.